Equitrol II Feed-Thru Fly Control has different options and/or variations, please choose below. This product cannot ship to CA, ID due to state restrictions. Equitrol pellets in horses' feed prevent development of stable and house flies in the manure with 99% effectiveness. Feed-thru fly control is deposited in manure. Equitrol passes quickly through the digestive system. Will not harm domestic animals coming in contact with treated manure. Remains active for up to 6 weeks. 3.75 lb. plastic tub, 10 lb. plastic tub, 20 lb. box. DIRECTIONS FOR USE: It is a violation of Federal law to use this product in a manner inconsistent with its labeling. DO NOT USE ON HORSES INTENDED FOR SLAUGHTER. Feed the recommended dosage of Equitrol II to each horse separately to make certain he receives his full portion. This product should be fed top dressed on grain or mixed with the horse's total ration to provide 6.8 mg of diflubenzuron per 100 lbs. of body weight. For an occasional finicky eater who does not accept new feeds readily, mix this product with sweet feed or grain ration. 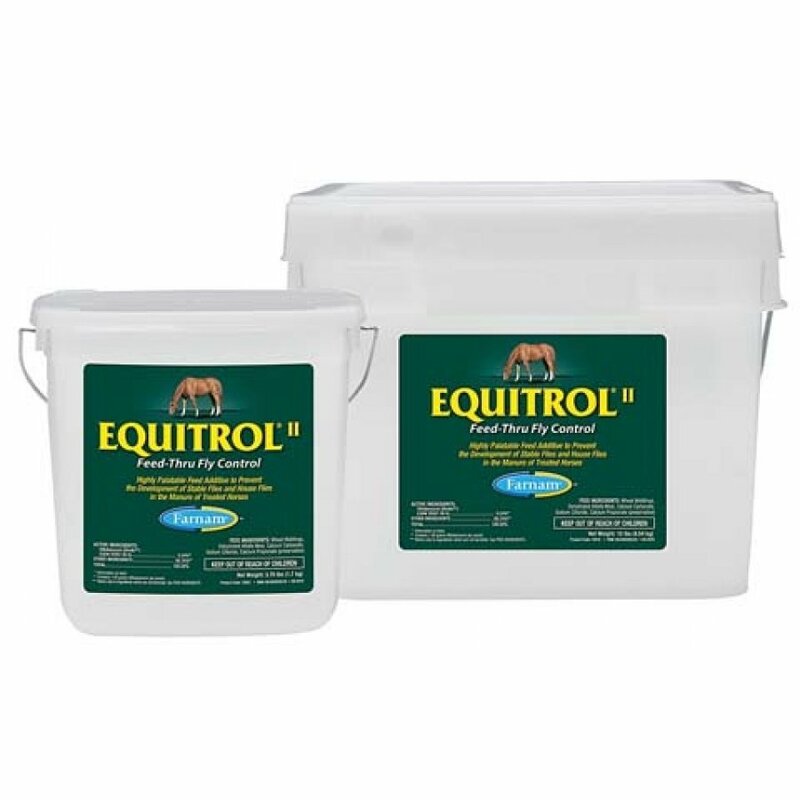 Start feeding Equitrol II early in the spring before flies begin to appear and continue feeding throughout the summer and into the fall until cold weather restricts fly activity. 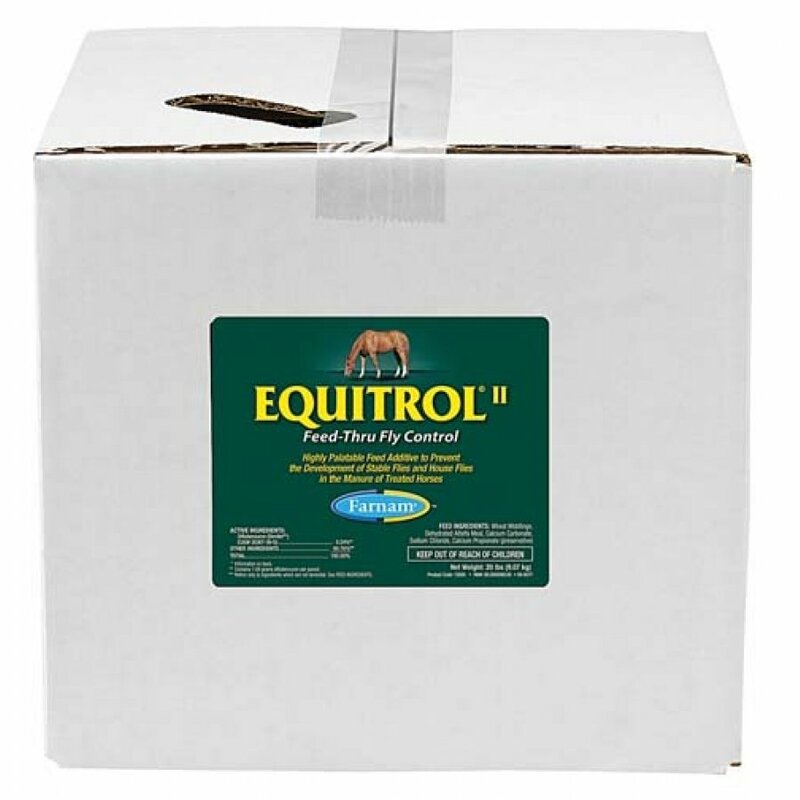 Equitrol II contains an insect growth regulator which prevents the development of house flies and stable flies in the manure of treated horses, but is not effective against existing adult flies. In some cases, supplemental fly control measures may be needed in and around paddocks and buildings to control adult house and stable flies which can breed in other decaying vegetable matter or silage on premises, or that migrate in from other areas. Equitrol II should be used as part of an integrated pest management program aimed at reducing fly populations in the horse's environment. Consult your retailer for program recommendations. 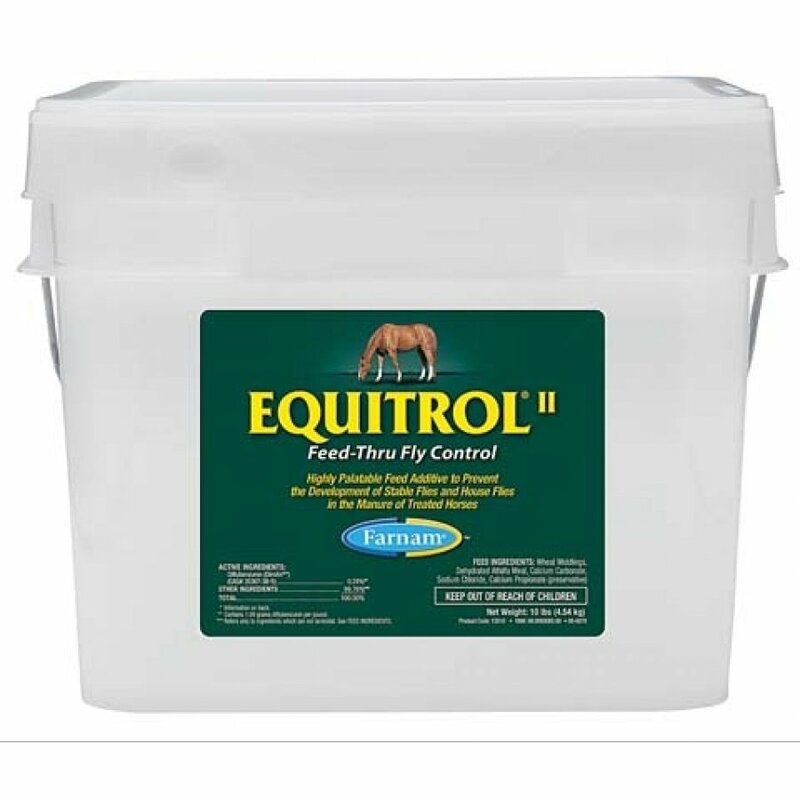 In order to achieve optimum fly control, Equitrol II should be used in conjunction with other Farnam brand premise and on-animal products as well as good management and sanitation practices. For larger horses over 1,300 lbs. of body weight or draft horses, feed an additional 1/5 oz. for each additional 200 lbs. of body weight. Made in the usaWheat Middlings, Dehydrated Alfalfa Meal, Oat By-Product, Calcium Caebonate, Lignin Sulfonate, Sodium Chloride, Propionic And Acetic Acids (Preservatives).